This post originally appears in PATH’s Advocacy for Impact blog series. Every day in Kakamega County in western Kenya, 37-year-old Hawa Muka Musa feeds and dresses her four children, collects her vegetables, and sets out to sell them in a busy, dusty market. For a full day’s work, she’ll earn about one US dollar, or 100 Kenyan shillings. It isn’t much, but it allows her to keep her children clothed and fed. Pregnancy was expensive for Hawa with her first three children, because the recommended visits to the health clinic meant time away from work. Attending prenatal visits often took half-a-day―and that time resulted in lost income. As advocates for women and children’s health at PATH, we were concerned about the women and families, like Hawa’s, who might be affected by revisions to the program. To ensure that Imarisha Afya ya Mama na Mtoto Program would continue to save lives, we worked with the Kakamega county legislators to encode the program into law. Together, we drafted language—first for initial regulations, then for the eventual bill—that would scale the program by converting it into a county fund. We partnered with civil society, including the Kakamega Maternal, Newborn, and Child Health (MNCH) Alliance, which was instrumental in encouraging County Assembly leaders to publicly express their support for the bill. Kakamega County Governor H.E. 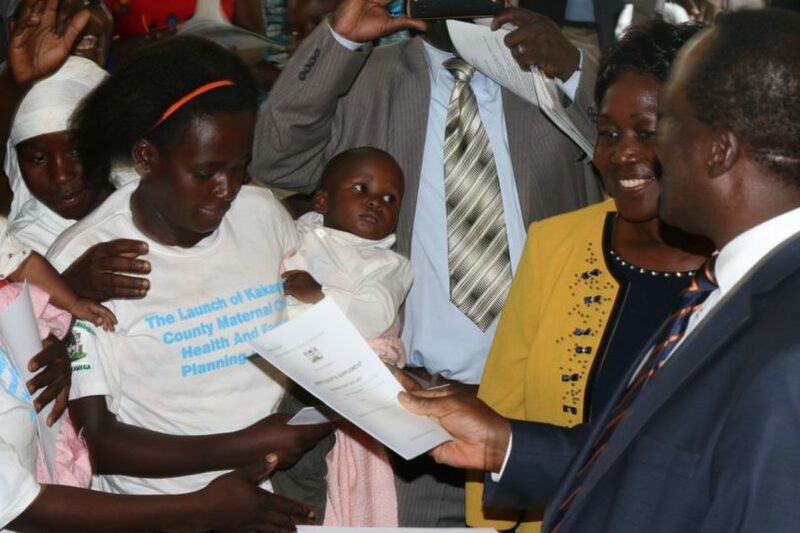 Wycliffe Oparanya shares copies of the Kakamega County Maternal Child Health and Family Planning Bill 2017 with mothers at the launch of the new law, which supports the most vulnerable women in the county. Photo: PATH/Joyce Matogo. In late July, 2017, the Kakamega County MNCH and Family Planning Bill was signed into law. The legislation sets aside 3 percent of the county health budget for cash transfers to women who utilize the recommended services, and reserves 1.5 percent of the county health budget for stipends for the community health volunteers that support these services, in line with national policy recommendations. Read more posts in PATH’s Advocacy for Impact blog series where their global team of advocates share how they help improve health and well-being in the countries where they live and work. Banner image: Hawa Muka Musa is a beneficiary of Imarisha Afya ya Mama na Mtoto Program that provides cash incentives for the Kenya’s neediest women to access prenatal and postnatal care. Photo: PATH/Steve Biko. Pauline Irungu is the Advocacy and Policy Manager. She leads PATH’s advocacy for stronger policies and investment in maternal, newborn and child health and global health research and development in the East African region. Prior to this role, Pauline led PATH’s Global Campaign for Microbicides (GCM) in East Africa, advocating for an enabling policy environment for research and development of women-initiated HIV prevention options.